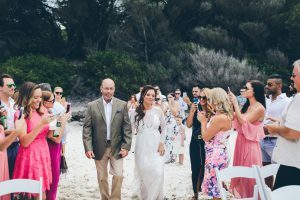 Beach ceremonies are super popular, especially over the warmer months in Australia, everyone loves the beach! 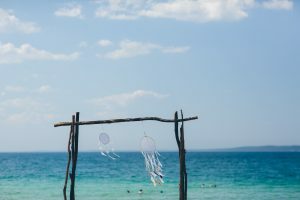 Here are some important things to think about when deciding if a beach ceremony is for you, and tips for how to host your ceremony on the beach. Being a public location, there can be a tonne of noise so it’s important to have a think about how you can accommodate for this. Noises like seagulls, the beach itself, cars driving by and the general public can all play a part. Ensuring your celebrant has a good PA system and is comfortable in projecting their voice so all your guests can hear is important and making sure the ceremony chairs are not too far away from your alter so guests are in a close position. Doing a test and trial run may be helpful in this case too. 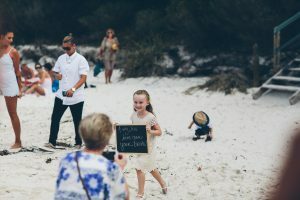 There are no trees or dappled sunlight on the beach, compared to a garden ceremony, and depending on the time of year its super important to ensure your guests are comfortable, especially in their suits! -Considering having your ceremony on a reserve overlooking the ocean where there may be some sand, rather than directly on the beach itself. The realities are that unfortunately on the beach its rarely a mild, slightly warm perfect day, especially on the south coast! 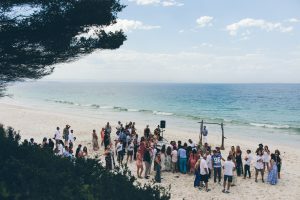 It’s important to consider that nature certainly plays its part in having your ceremony on the beach. Wind; Were you going to have material from your arbour, the wind can really play havoc on material draping and draw attention to the wind. 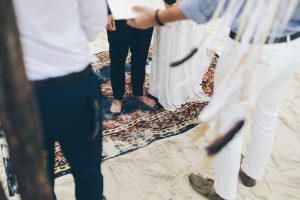 Tides; Some beaches are quite thin, meaning there may not be enough space for a ceremony/chairs and set up when the tide is high, consider placing your ceremony on another beach or another area of the beach or even on an angle and not directly at the ocean to make sure there are no risks of the ceremony being swept away! How accessible is the beach you want to get married on? Do you have elderly guests attending that may be unable to walk on the sand or down a sandy path? Have a think about your guest’s list prior to locking in your ceremony location. Also ensure your celebrant and stylist are comfortable working on the sand, in the middle of January on the beach can be a very difficult environment to set up a wedding, trust us! 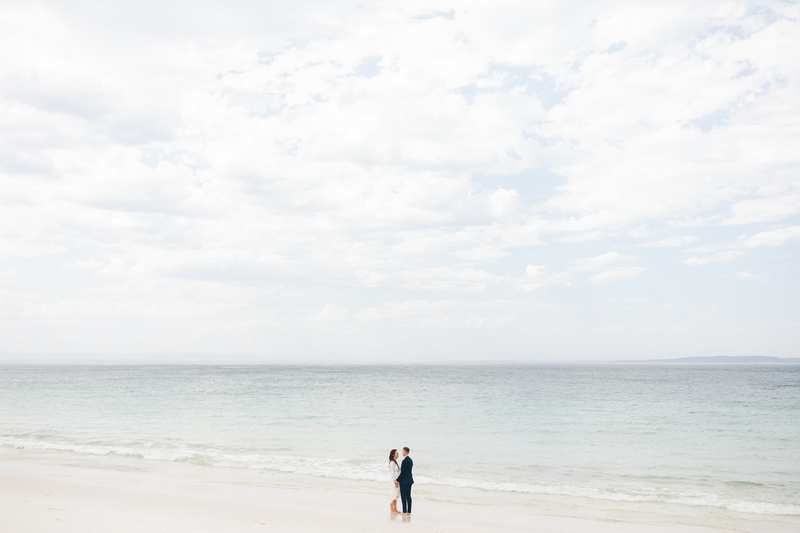 Have you considered what council permit is required to have your ceremony on the beach? 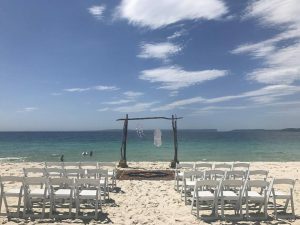 Some beaches in our region don’t allow ceremonies or have very strict restrictions such as maximum 30 guests, no amplified music or no ceremony décor or flowers allowed, so look into this before getting your heart set on a location! Being in a public place, consider the privacy of your ceremony when being held on the beach. The public has access so you may have people swimming in front of your arbour in the ocean or walking in swimmers next to your dolled up wedding guests! Sometimes of the year like weekends or during school holidays will be even busier so consider the time of year when deciding on your ceremony location. It’s always really important to have a backup plan, no matter where your ceremony is held. But the beach is not protected like a garden ceremony meaning it’s a higher risk location to host your ceremony. Having something on hold or a clear backup plan discussed with your wedding planner or celebrant and stylist is really important in advance so everyone is on the same page. 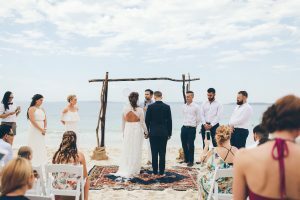 There are lots of things to consider when choosing a beach ceremony, more so than other ceremony locations, but being prepared and aware means you can host the perfect beach ceremony.